A new engineering laboratory that enhances the University of Central Florida’s leading role in modernizing and sustaining the nation’s power grid is opening this week, in concert with the national DistribuTECH conference in Orlando. The 660-square-foot Smart Grid lab, located in the Harris Engineering Center on UCF’s main campus, will provide a real-world environment and hands-on experience using advanced technology – real-time digital simulation, hardware-in-the-loop testing, power system protection and more – for research faculty and about 220 students per year. “The lab will enable us to perform advanced smart grid research, develop curriculum and course offerings, partner with utility companies on their research and development projects, and collaborate with other universities,” said Zhihua Qu, chair, UCF Department of Electrical and Computer Engineering. The new Smart Grid lab will be connected to power sources on campus, such as solar arrays and an on-campus power plant. The Smart Grid lab at UCF is the latest development in a national, multi-partner consortium that Qu leads, known as “FEEDER,” or the Foundations for Engineering Education for Distributed Energy Resources. FEEDER launched in 2013 with an initial grant of $3.2 million from the U.S. Department of Energy that brought together eight universities, eight utilities, 11 industry partners and two national labs. It has grown to more than 50 partners – located nationwide from the east coast to California and as far as Hawaii. The partners are upgrading and sustaining the power grid though research, and by educating the current grid workforce, and recruiting and educating the future workforce. UCF is one of the nation’s largest producers of engineers, and its expertise in electrical and computer engineering makes UCF an ideal leader for the project. Researchers in FEEDER are analyzing the infrastructure inside the current grid to find ways to enhance its capacity and make it more efficient. They are also exploring ways to safely and efficiently process the amount of fluctuating energy currently fed into the grid from an increasing number of small, decentralized power producers, many of which generate power from renewable sources such as wind and solar farms. They are also envisioning and designing potentially new and better ways of integrating renewables. On the education front, the intent is for FEEDER universities to educate the nation’s current and future smart grid workforce by working together to develop and deploy updated, shared curricula, guest lectures and workforce training activities. FEEDER aims to attract and educate more students to become future power engineers, to address real-world research and development challenges, to train existing workforce and speed up technology transfers, and to realize smart grid implementation. UCF’s many power and energy resources provide hundreds of electrical and computer engineering students hands-on, real-world smart-grid experience that will help them in their careers. 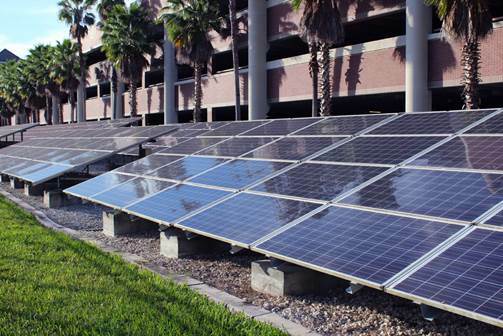 UCF’s Florida Solar Energy Center, also part of the FEEDER effort, has numerous research projects underway, including a study of the impact that the nation’s increasing number of electric vehicles on the road will have on the power grid. And last fall, the university announced a faculty research cluster to bring together and recruit multi-disciplinary experts to advance power systems science. The Resilient, Intelligent and Sustainable Energy Systems (RISES) cluster, also led by Qu, will facilitate collaborative research in the deployment and integration of renewable energy resources, and provide innovative solutions that make electricity grids self-organizing, efficient and resilient. UCF is committed to green initiatives and supports the Climate Action Plan, an ambitious guide that the university is taking to become climate neutral by 2050. Qu is a nationally renowned expert in distributed control and optimization of smart grids. In 2009, he was elected as a Fellow of the Institute of Electrical and Electronics Engineers (IEEE) for his scientific contributions in electrical and computer engineering. He joined UCF’s faculty in 1990, and was named chair of the Department of Electrical and Computer Engineering in 2011. He holds a Ph.D. in electrical engineering from the Georgia Institute of Technology. The DistribuTECH conference, Feb. 9-11, at Orange County Convention Center, will also feature some work produced by UCF engineering students. Five research posters created by 10 UCF electrical and computer engineering students will be presented at the conference, and more than 40 students will attend along with Qu.